The Night It Up! 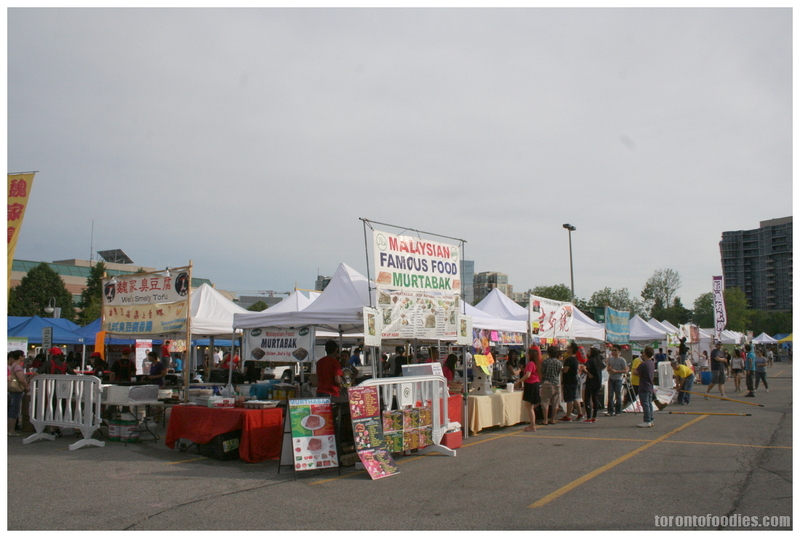 (@nightitup) Markham Night Market is getting bigger and better, with more food variety than ever before. In its 11th year, the annual event is organized by the Power Unit Youth Organization (@powerunityo) , with Second Harvest as the event’s beneficiary this year. 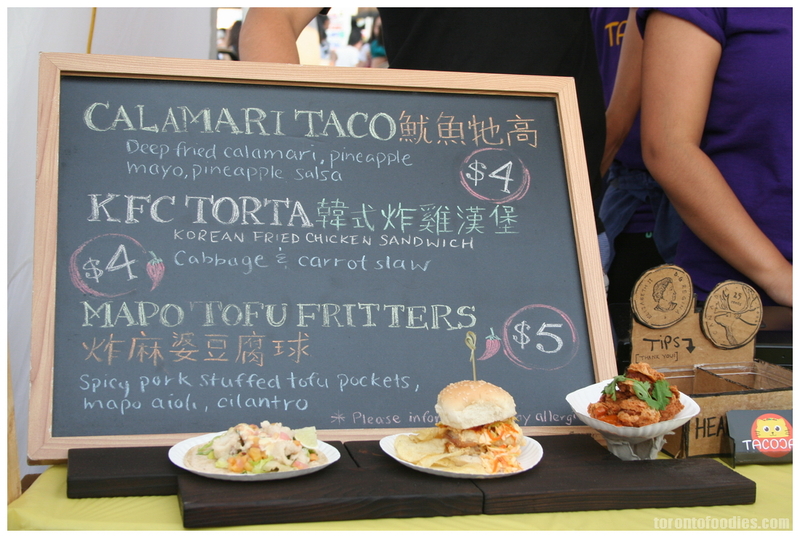 Some of this year’s new vendors include Me.n.u Food Truck , El Perro Heffe , Extreme Noodles, and Modernist Dessert. 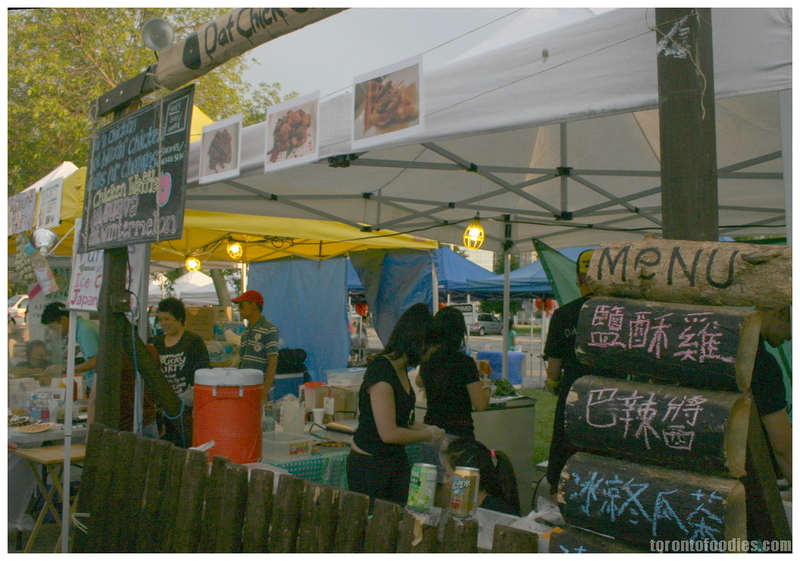 It’s a good venue for culinary entrepreneurs to test out new food offerings, though the crowd can sometimes favour the longtime night market regulars (stinky tofu, oyster pancakes, lamb skewers, grilled squid). 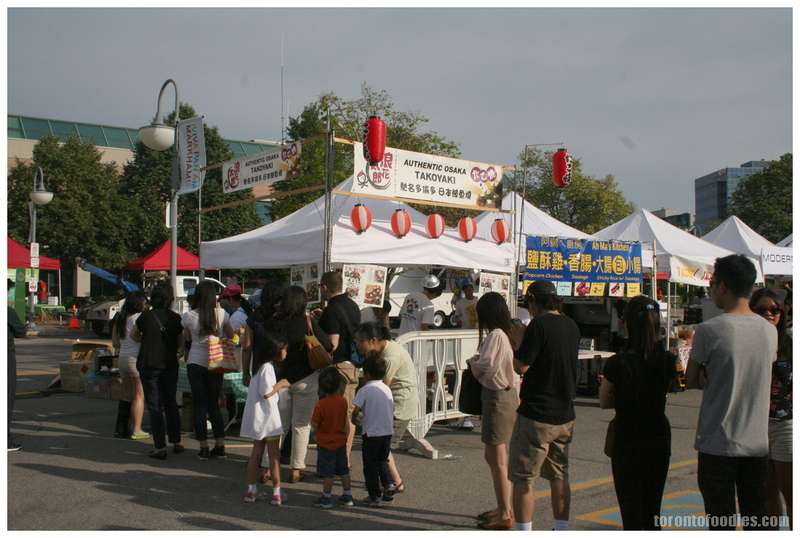 This is the third year that the event has been held at the Markham Civic Centre, and the venue definitely affords them a generous amount of real estate to have a sports zone with multiple basketball and volleyball courts. 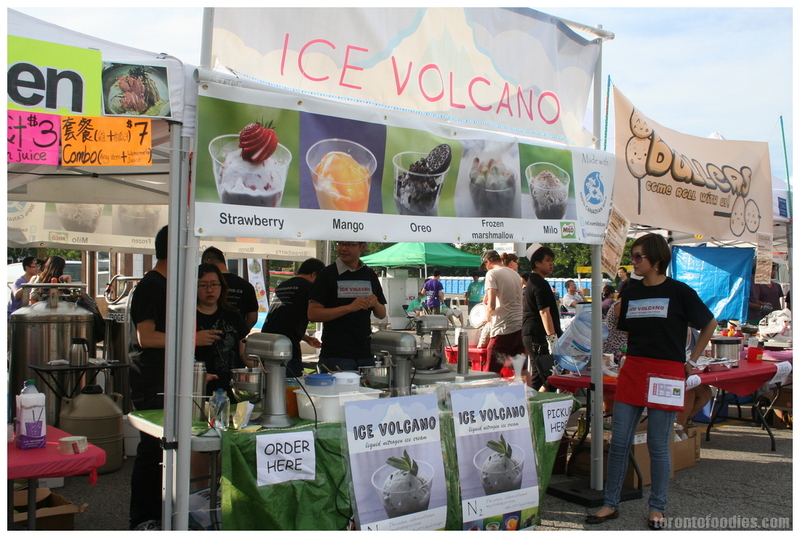 They promote vendor use of biodegradable and recyclable products, with the appropriate receptacles around the venue. Despite advertising a 7pm start time, this were well underway by 6pm on Friday evening. 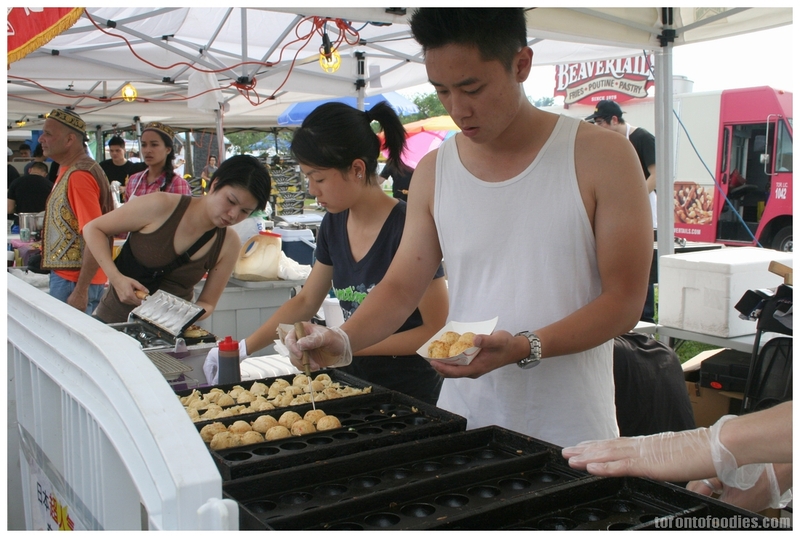 Wei’s Smelly Tofy, one of the longtime vendors since the Toronto Night Market’s inception, already had 10 people in line for their deep fried stinky tofu. The iconic pungent mainstay is definitely an acquired taste, but felt a lot less pungent than in other years — I’m sure patrons unfamiliar with the delicacy were thankful. 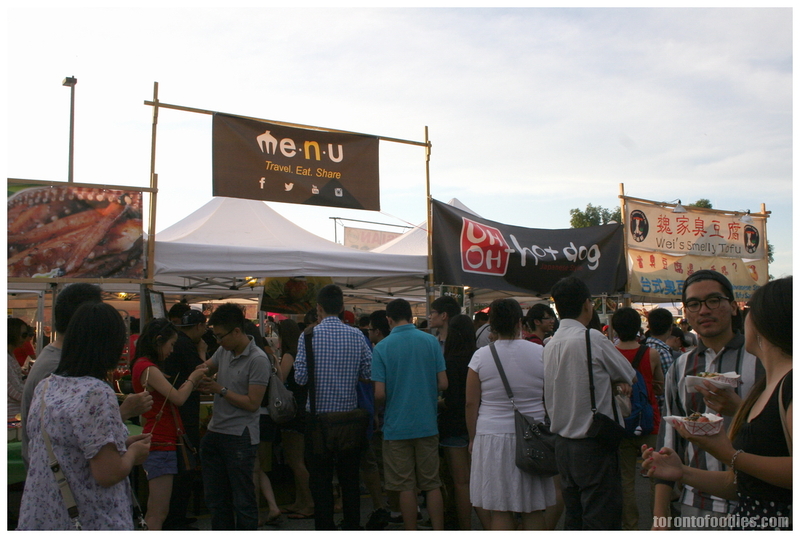 The longest lines of the evening belonged to Wei’s Smelly Tofu, Wei’s Oyster Pancakes, 167 Lamb Skewers, and Mama Bear’s Stinky Tofu — some of those with over 30 people in line at some point in the evening. 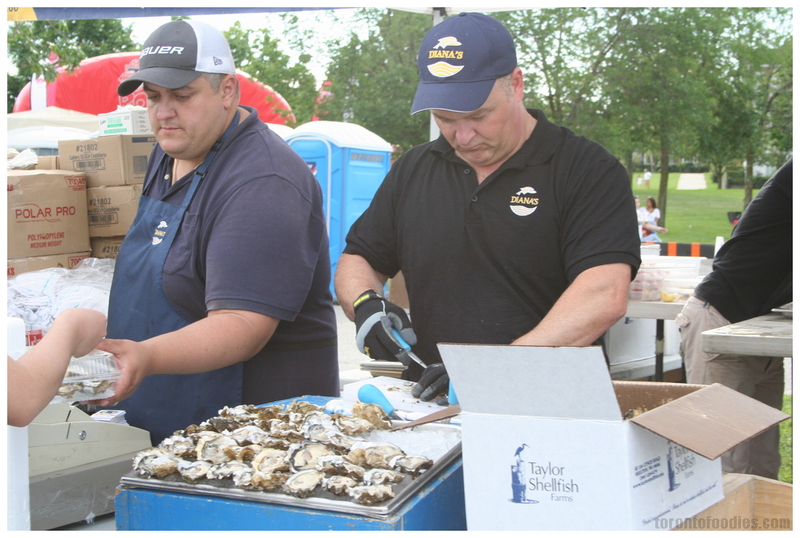 Diana’s Seafood’s fresh-shucked oysters and Me.n.u Food Truck’s rice balls also racked up some queues. 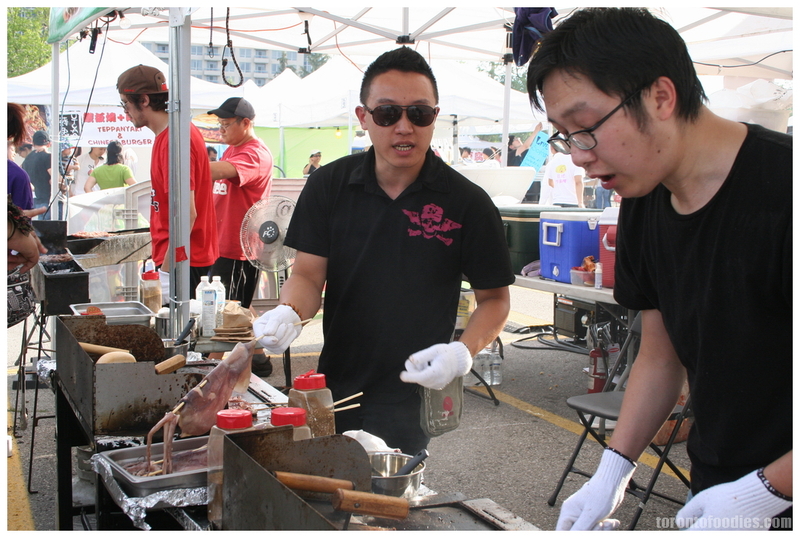 Squid/Ikayaki were plentiful this year, at both EatTO (http://eatto.ca, a food map site) and BBQ Lamb & Squid (who had two separate booths). It was delightful to see eaters work their way around the mammoth skewers of unwieldy squid, faces beaming yet contorted, trying to figure out the least messy angle of attack. 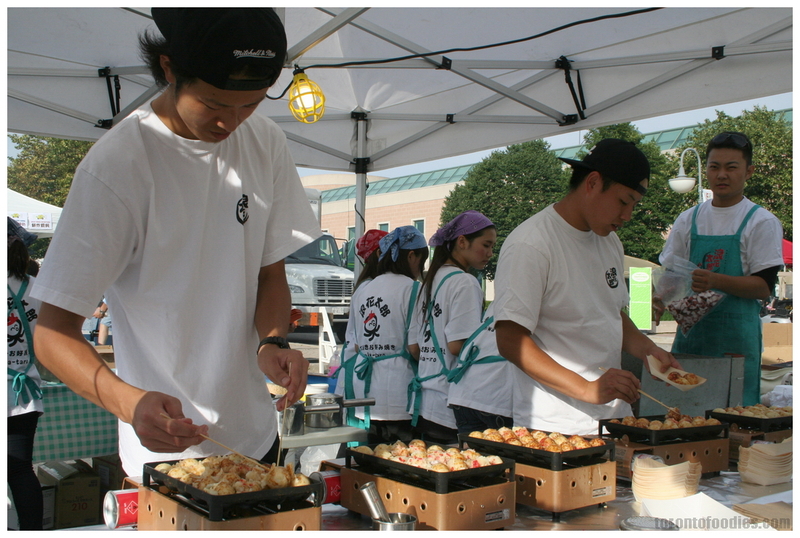 I counted at least two takoyaki (Japanese grilled puffs containing a chunk of octopus, topped with Japanese condiments like kewpie mayo, takoyaki sauce, bonito flakes) vendors this year. 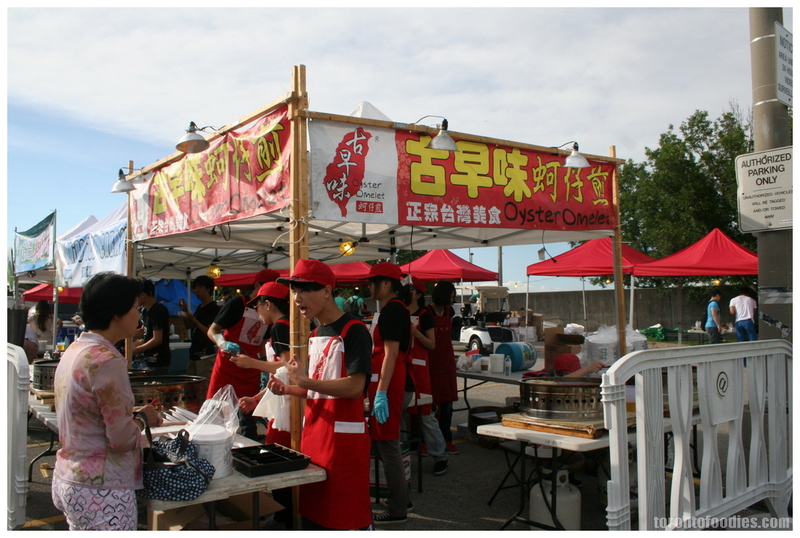 There was the bustling stall from Naniwa Taro (at the Taste of Asia Food Court at T&T, Steeles/Middlefield) advertising authentic Osaka Takoyaki, while Takoyaki Taiyaki Ikayaki offered takoyaki alongside grilled squid and taiyaki – fish-shaped pastries filled with red bean paste, cooked in devices resembling waffle irons. I’ve had my fill of takoyaki recently, so didn’t try them here. 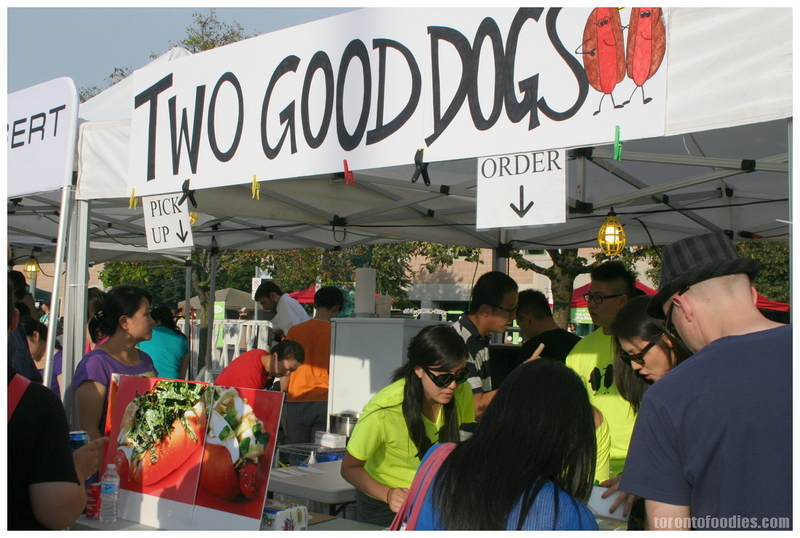 Asian fusion hot dogs also infiltrated this year’s market with Two Good Dogs and Uh Oh Hot Dog (also listed as Japadogs, though not affiliated with the Vancouver-based chain, as far as I know). It feels like almost a decade ago that Japadogs exploded on Vancouver’s food scene, garnishing hot dogs with Japanese ingredients like bonito flakes, kewpie mayo, and nori (seasoned dried seaweed). 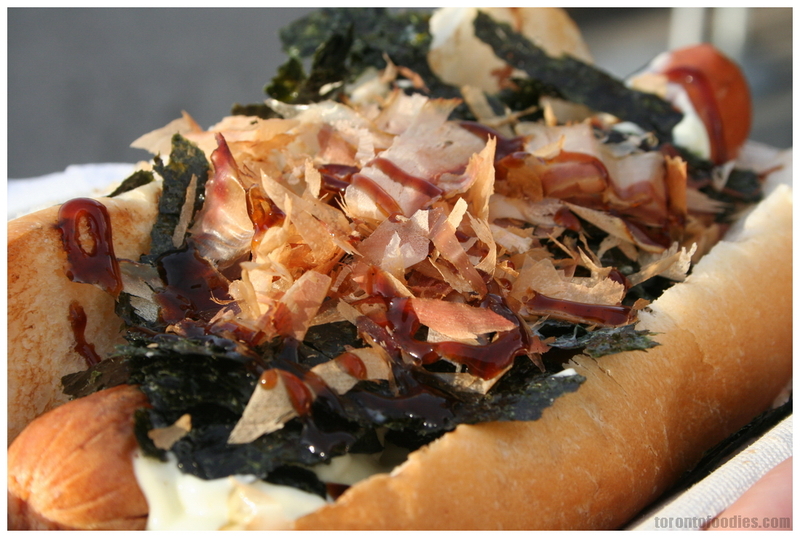 We tried the Japanese Dog ($5) at Two Good Dogs, topped with bonito flakes, mayo, shredded nori, and takoyaki sauce. 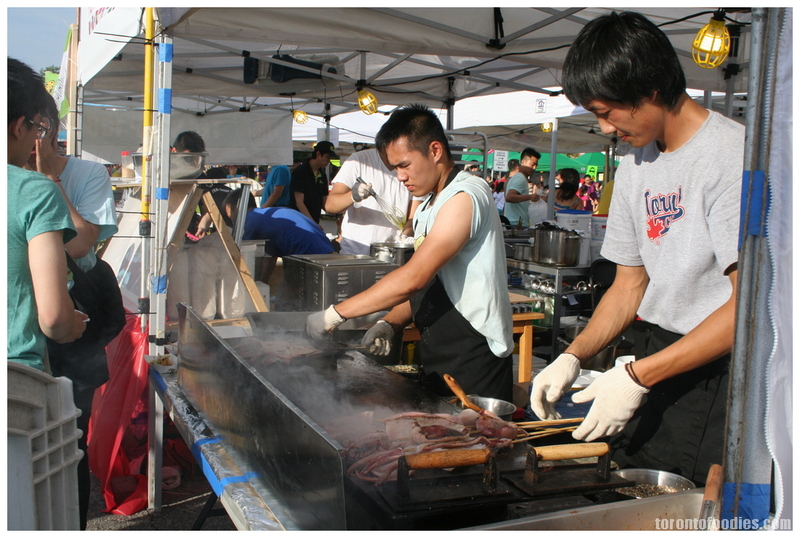 The hot dog was very similar to street vendor jumbo beef dogs, with a very lightly toasted bun. Unfortunately, the bun size was far too large, and the toppings flounder and disappear among the bun and dog. I think a smaller bun, possibly steamed, would have worked together much better. I came away a bit disappointed. I had come across El Heffe Perro (@elperroheffe) recently on social media, so I was excited to try out their tacos. 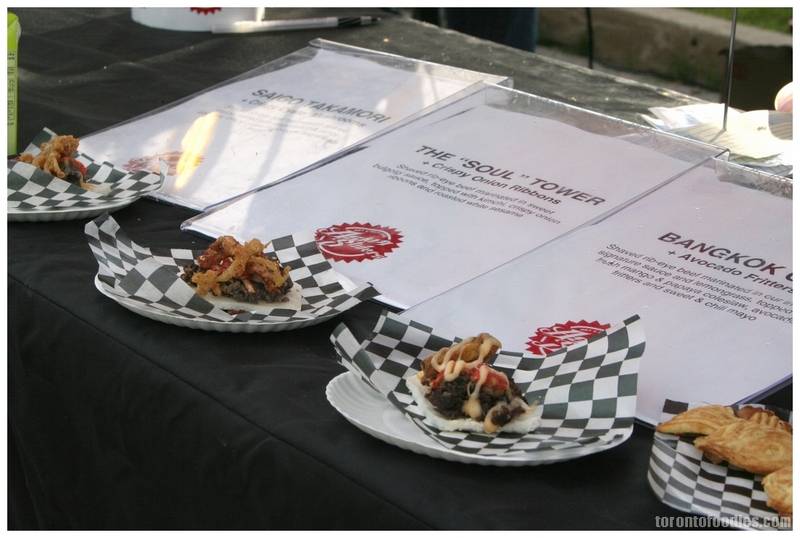 For NIU, they devised some Asian-inspired dishes – Hot & Sour Chicken, Sambal Shrimp, and El Diablo Octopus. They use fresh-pressed tortillas at their pop-up location in Little Italy (on college), but the logistics of NIU made that impossible — though they did toast up their tortillas on the grill before serving. Hot & Sour Chicken w/ chinese cabbage, peppers & onion ($3) was my favourite of the trio. 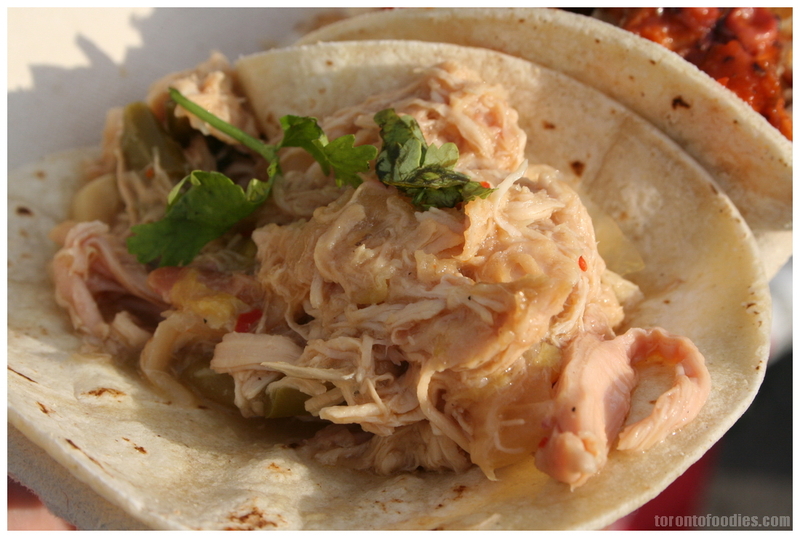 This was closest to what I would expect from a great taco, with its balance of savoury, tart, and spice. The hit of cilantro on top completed the dish for me, providing that burst of freshness to contract with the cooked elements. 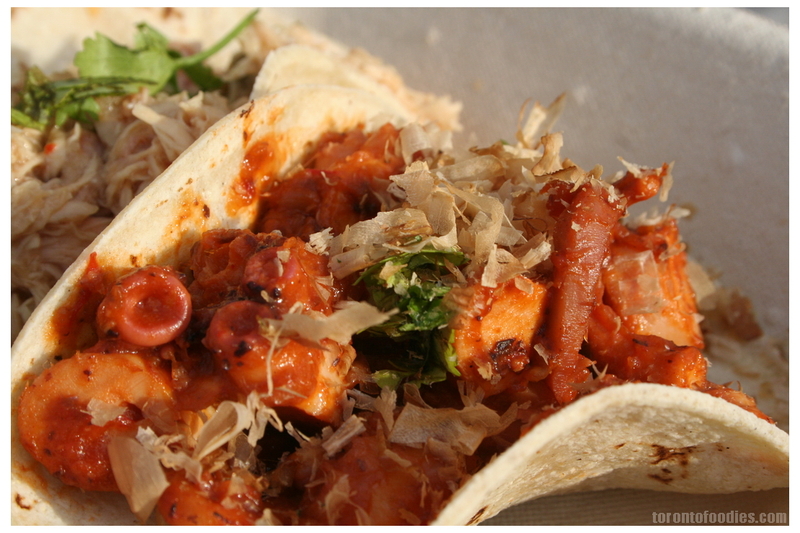 El Diablo Octopus w/ cilantro & bonito flakes ($3.5) was promising. The octopus had been cooked in a red sauce, though the specific flavours escaped me. I was very impressed with how meaty yet tender the octopus was. That said, the cilantro and bonito flakes were severely overwhelmed by the meatiness of the octopus, their flavours barely registering. It definitely needed something acidic to brighten the dish and contrast the heavy meatiness, especially for the summer weather. 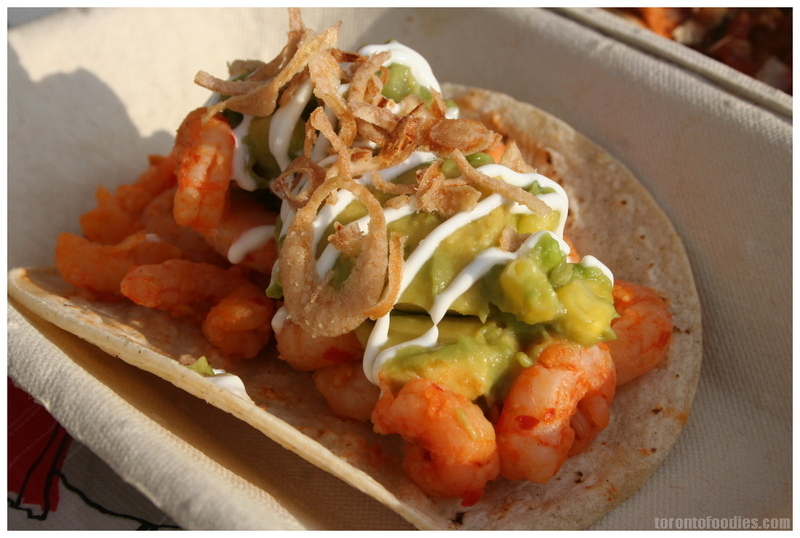 Sambal Shrimp w/ corn-avocado salsa, crispy shallots ($3.5) didn’t leave me with any particular impressions. The corn-avocado salsa sounded great, but those ingredients didn’t shine as brightly as I had hoped. Me.n.u Food Truck (@MenuFoodTruck) has been on a tear lately, selling out promptly at TOFoodFest and making a cameo on Fidel Gastro’s Rebel Without a Kitchen. He’s been chronicling his journey to start his own food truck for the past half year, including his culinary exploration travels through Asia and the exhausting hours of kitchen prep leading up to NIU2013. It’s no surprise that a crowd (where I met Vicky ~ @momwhoruns) had formed well before his booth was ready. 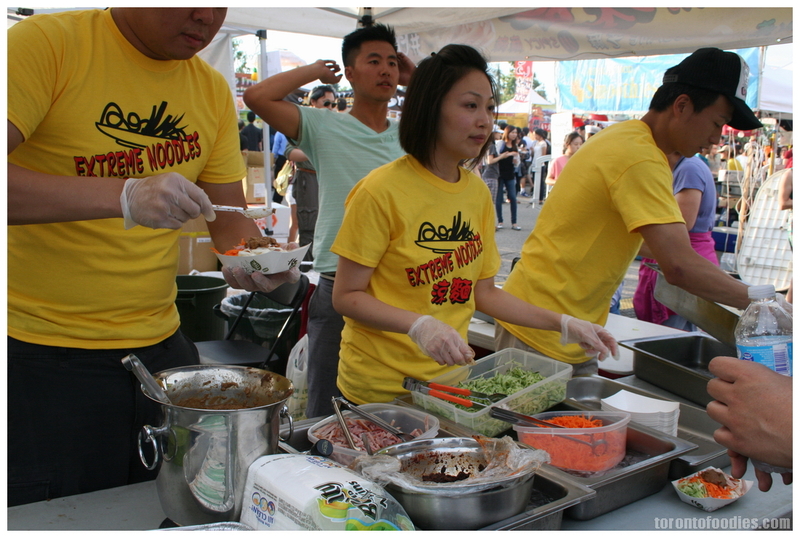 It looks like he’s still working through some workflow issues — there were long lulls in service while deep frying was taking place — but his team kept the booth lively and entertaining with games while the patrons waited. He had a pretty reasonable price point at $3 per rice ball. 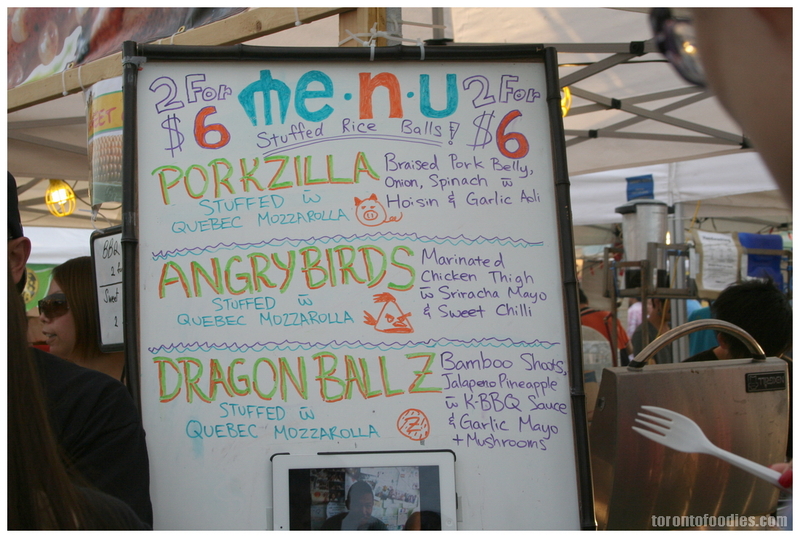 We had the pork-based Porkzilla and chicken-base Angry Birds rice balls. 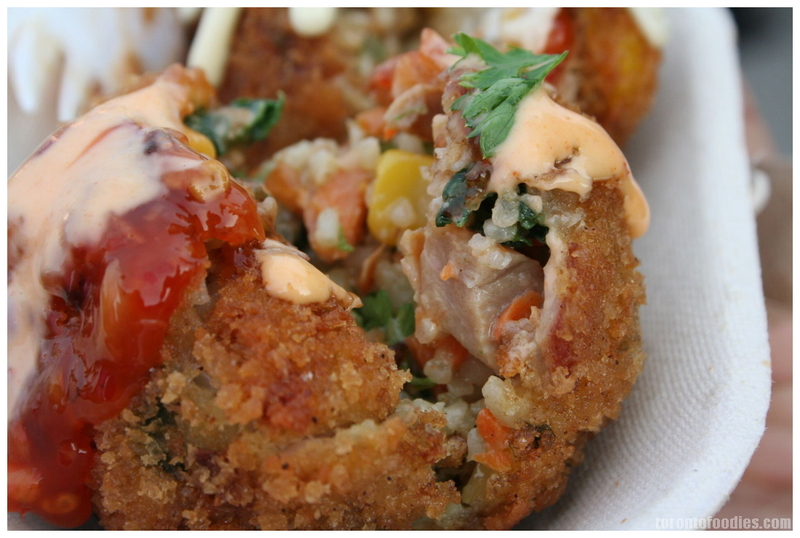 Both rice balls were very well done, with a very crispy, thin flour/egg batter, with the interior a full mix of meat, veggies, herbs, and seasoning, rather than plain rice around a meaty centre (like an italian arancini). 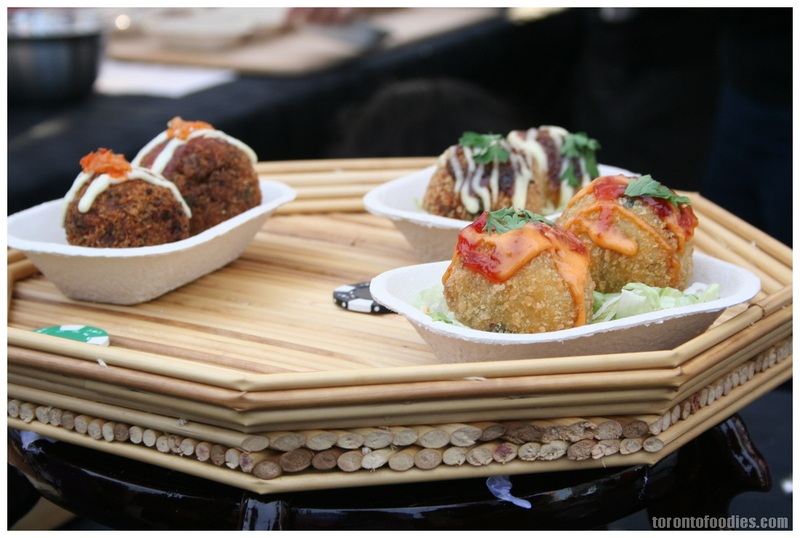 In fact, calling them “rice balls” may give them far too little credit. The chicken was more vivid of the two, as expected with the use of the ever-beloved Sriracha. Both were perfectly fried, with a light crisp shell. With the wealth of ingredients, it was pretty difficult for the pork belly to really stand out, but that’s a good problem to have. 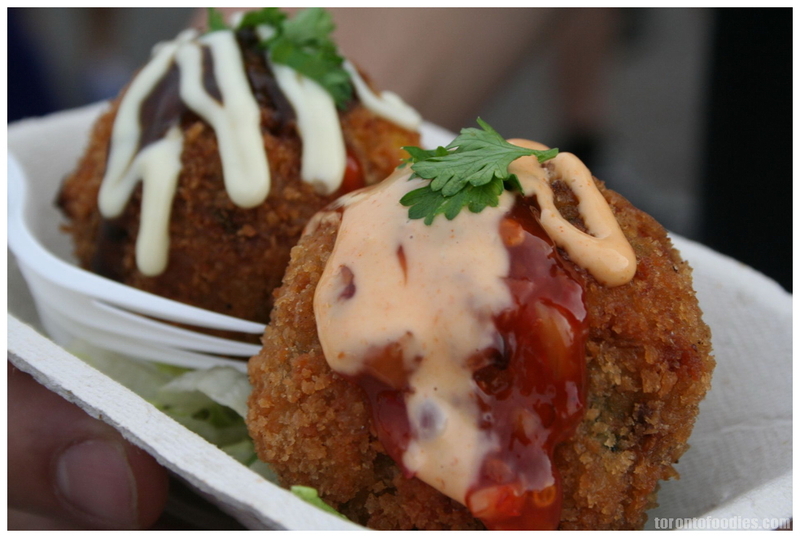 Of the 5-6 items I ate this year at NIU, Me.n.u’s rice balls are at the top of the list. For those that missed Me.n.u at NIU2013, they will be attending the T&T Waterfront Night Market as well, with Allen teasing a new menu item. 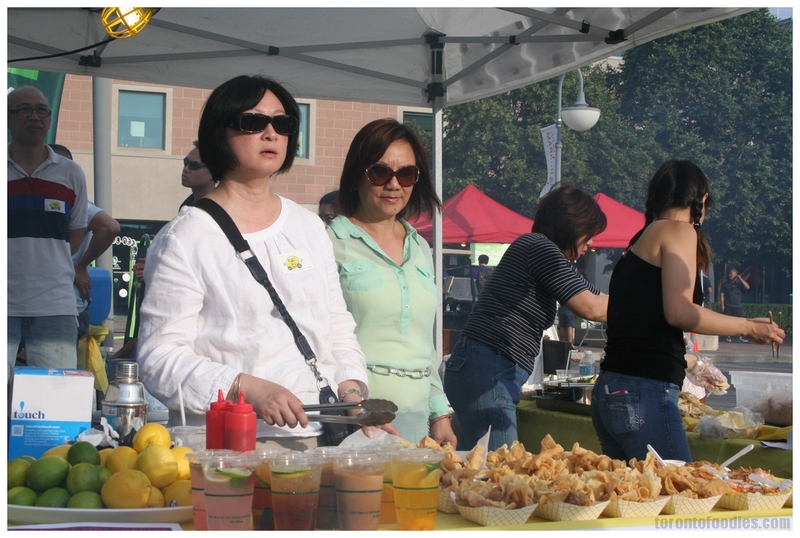 Extreme Noodles was launched by one of my friends, with help from her close-knit group of University of Western Ontario alumni friends. 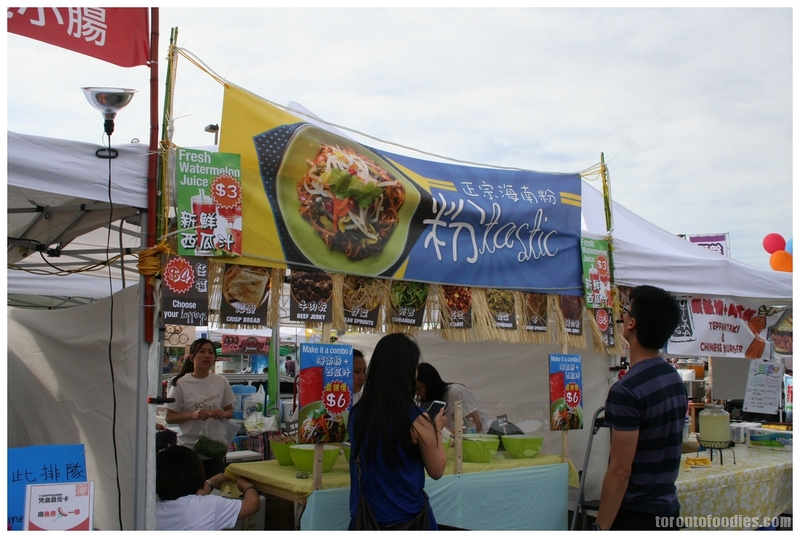 They offered Taiwanese cold noodles, offered in sesame sauce, extremely spicy, and vegetarian. 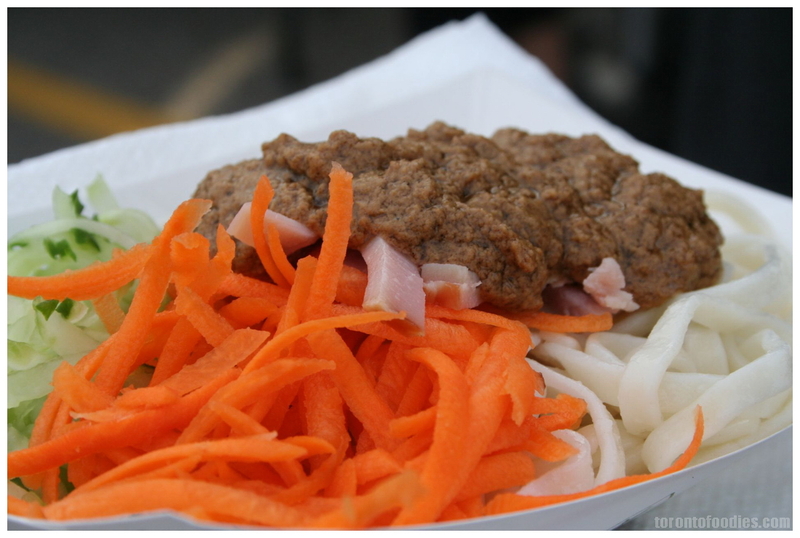 I had the sesame ($3), topped with refreshing cool cucumber, shredded carrots, mildly salty ham, and bound together by nutty earthy sesame paste. All the ingredients are light and subtle, never overpowering each other; the components all feel “right” served cold, and is a perfect street dish for hot summers. Despite the “extreme” in their name, this is a very traditional Taiwanese dish, and really hit its mark in flavour, balance, and nostalgia. In hindsight, I wish I had a chance to also try their spicy noodles — unfortunately, this was her first and likely last event as a food vendor. For those that enjoyed Extreme Noodles, please let her know in the comments! 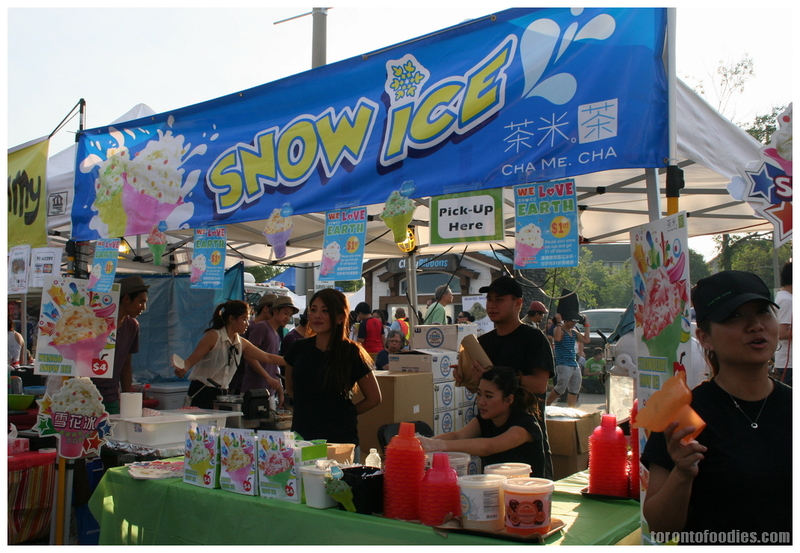 Cha.Me.Cha is one of several vendors selling a modern version of Taiwanese Shaved Ice. Traditionally, it’s prepared as a bowl of crushed plain ice topped with sweet Asian ingredients (red bean paste, sweetened condensed milk, various gelatins). This version shaves a block of flavoured ice into a heaping bowl of thin ribbons. 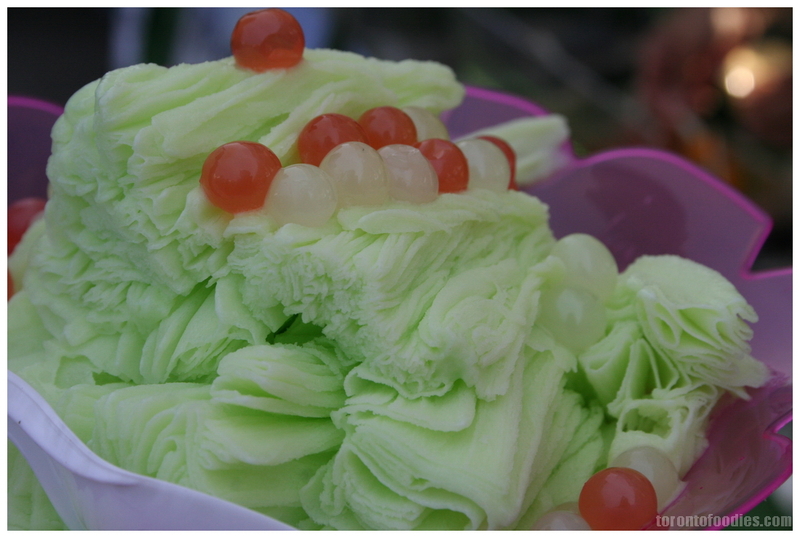 The honeydew flavour ($5) tasted a lot like Melona-brand honeydew popsicles, with abundant honeydew flavour. It was a bit lighter in texture from the shaving process, compared to Melona’s dense creaminess – this made for a very refreshing palate cleanser. They were topped with some juice-filled tapioca (similar to Menchie’s/Yogurty’s), but they didn’t really add to the experience — otherwise, I found it very enjoyable. 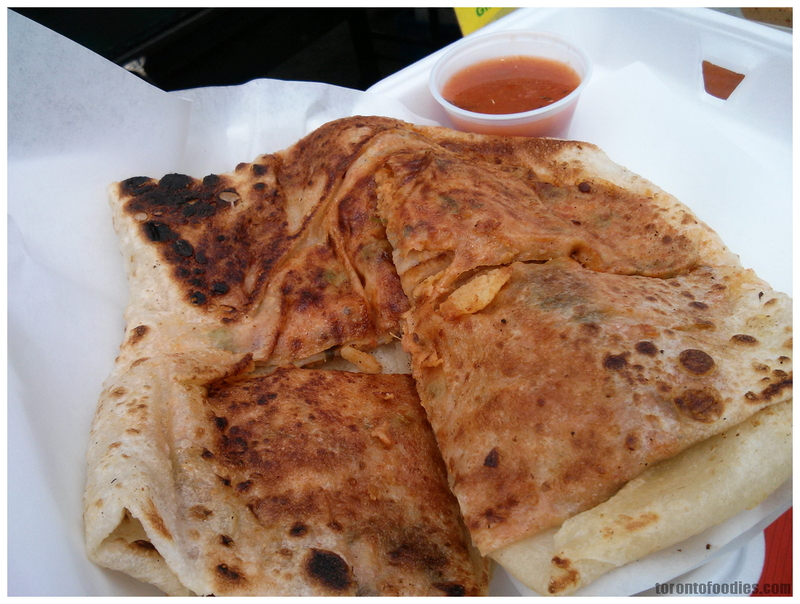 I had a great experience with Malaysian Kitchen (aka Pondicherry Catering) Murtabak at the Taste of Lawrence street festival last weekend, so I didn’t indulge in this during Night It Up. 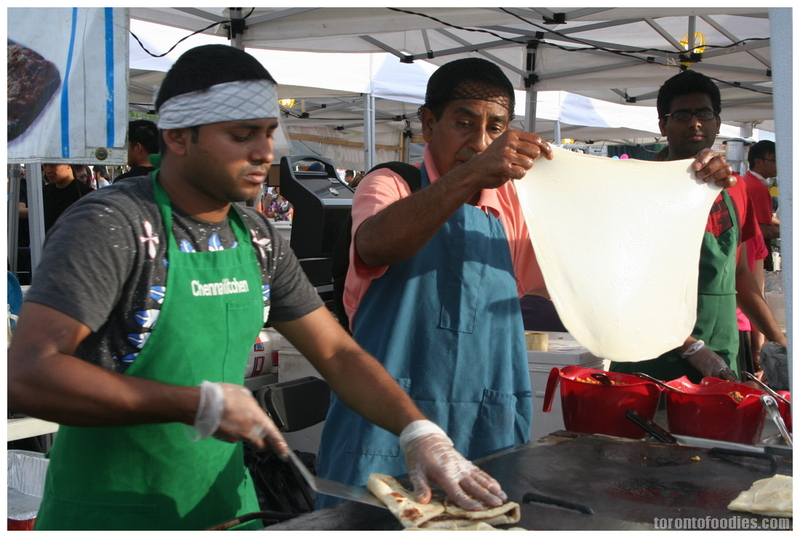 A ball of dough is hypnotically twirled and stretched into a thin flat roti, and blistered on a searing griddle. The chefs bravely stretches out the dough with his bare fingertips, dollops some well-seasoned halal chicken or beef, and folds and layers the roti into an enticing square packet. Though they have coconut and spicy chutneys available, I ate it plain, appreciating the light sweetness of the roti, while the mildly spicy ground chicken and peas held up to the multiple layers of crispy yet chewy roti. The following photo was from the last week’s Taste of Lawrence for $8 ~ I would willingly pay $6, but at $8 my pockets felt a bit light. 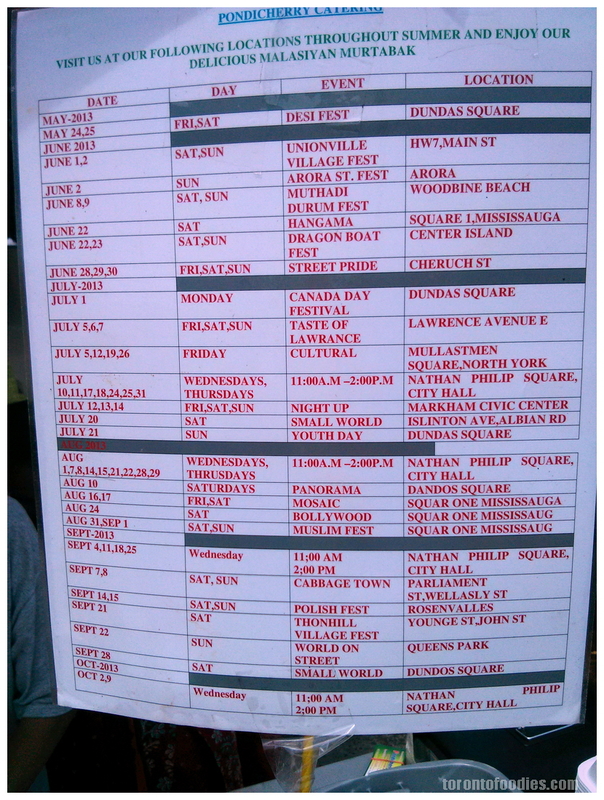 For those interested, here is their events schedule for the rest of 2013, including the Nathan Philip Square’s weekly Fresh Wednesday and Tasty Thursday lunches. 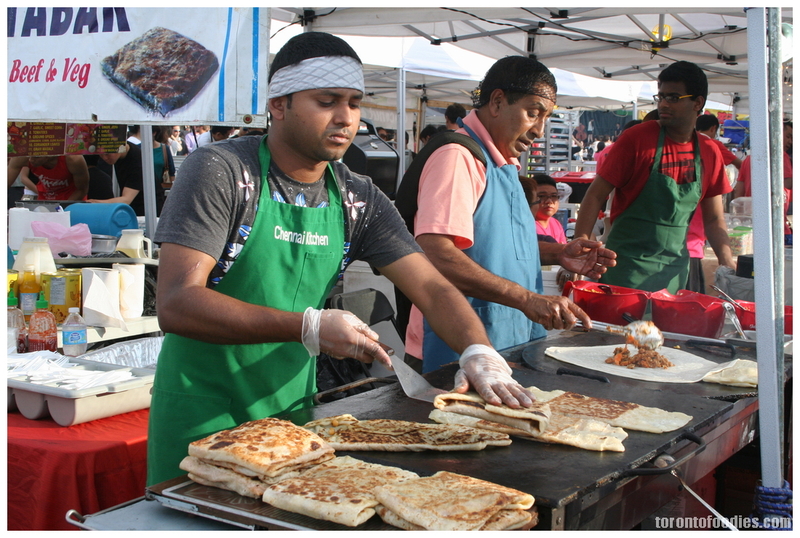 There was also a competing murtabak vendor at the Taste of Lawrence and last year’s Polish Festival in Roncesvalles, selling a variation of murtabak that incorporated eggs. 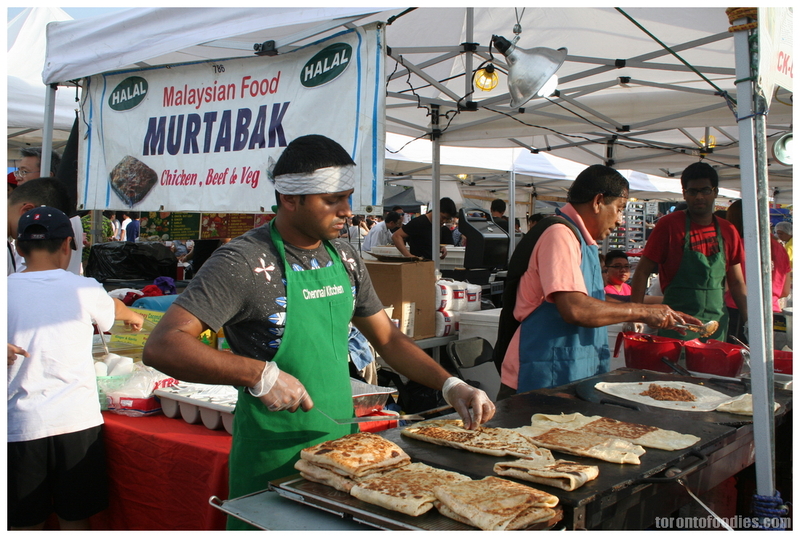 Their version was not as flavourful (but nevertheless good to try), so be aware that are multiple murtabak vendors around town. 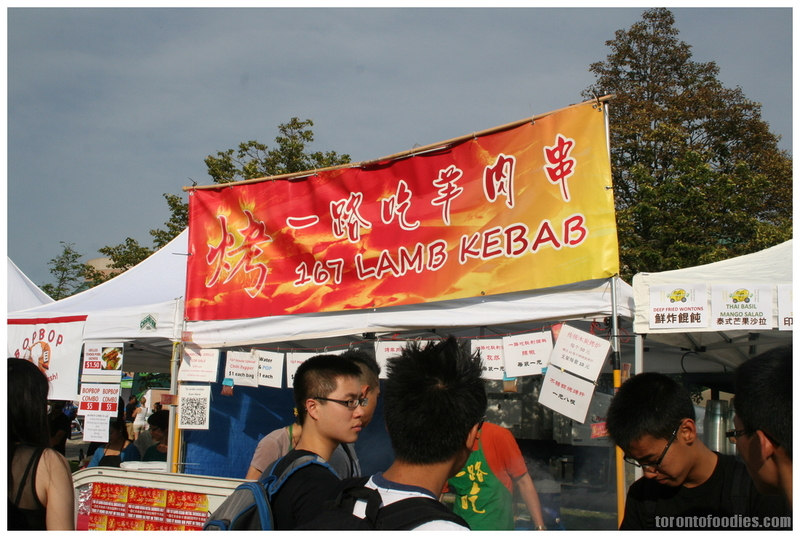 There were two lamb kebab vendors, 167 Lamb Kebab and Xin Jang Zheng Zong Yang Youchan. In Mandarin, “167” is a homophone for “eat all the way”. 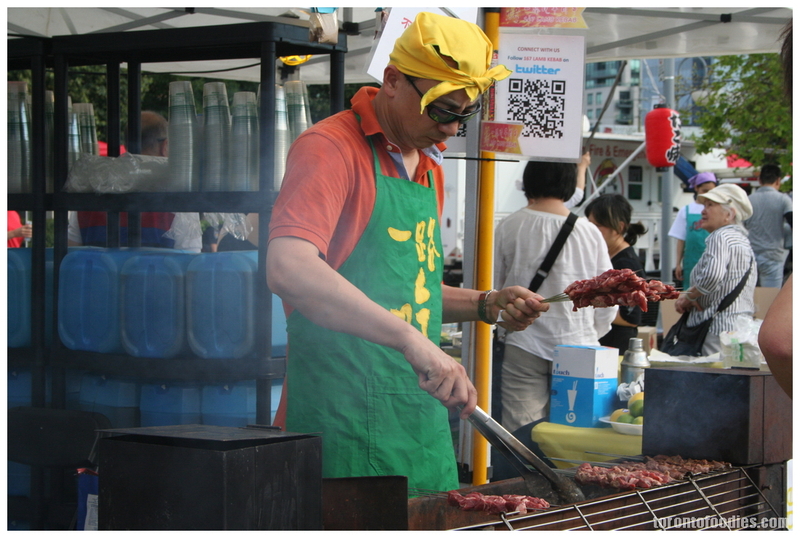 While both vendors filled the air with appetizing aromas of meat over charcoal, only 167 had a consistent queue of customers. I did not try either of these vendors. 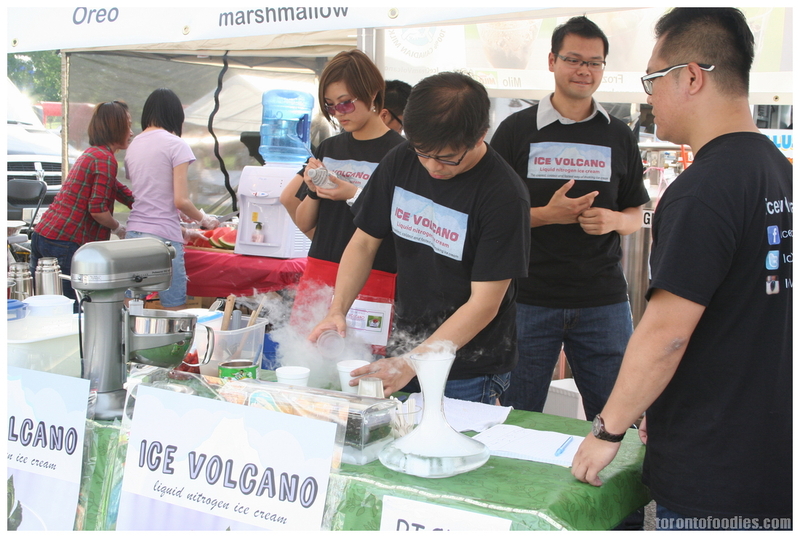 Ice Volcano (@icecreamvolcano) also showcased their nitrogen-assisted ice cream previously at TO Food Fest. While it was neat to see the all the raw ingredients go into making the ice cream, they could have been bolder with flavour ideas and played around with the nitrogen technology. 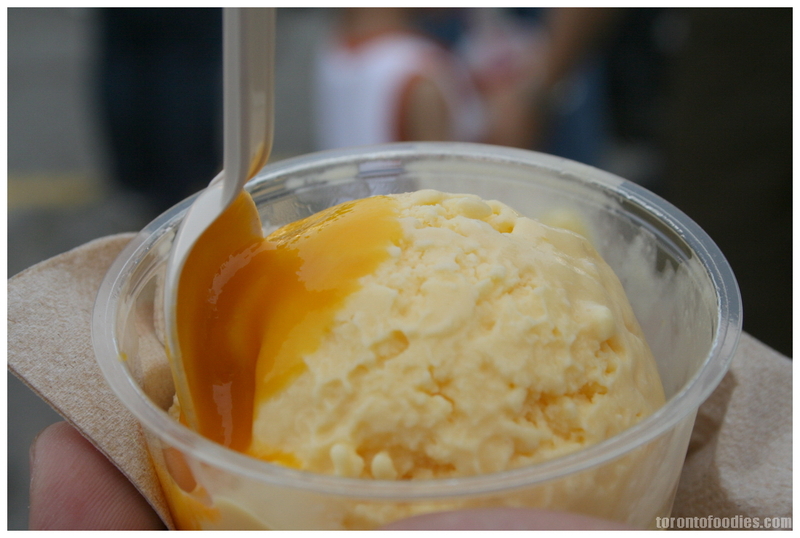 I tried their mango flavour — it was as good as any mango ice cream I’ve had elsewhere, though nothing extraordinary. 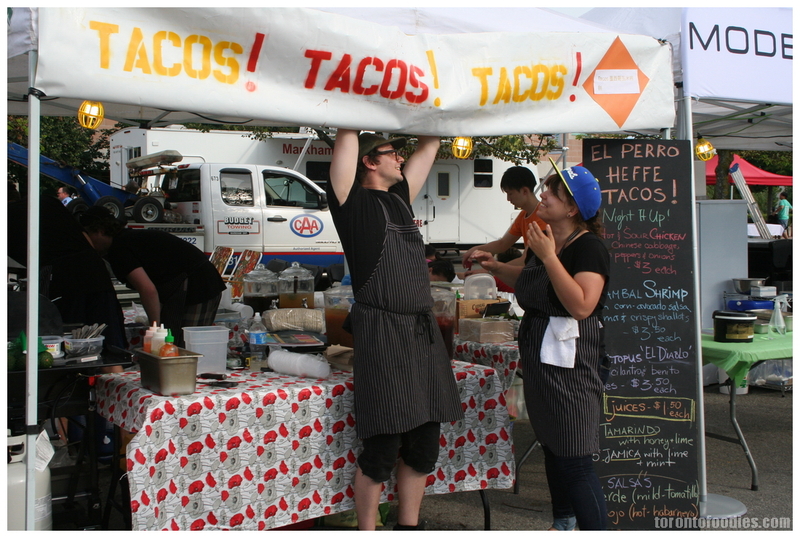 I read about TacoCat (@thetacocat) last year, in vendor descriptions for Night It Up 2012. They are a group of friends aiming to incorporate Asian flavours into the explosively expanding taco ecosystem, with different members bringing their own ideas for dishes. 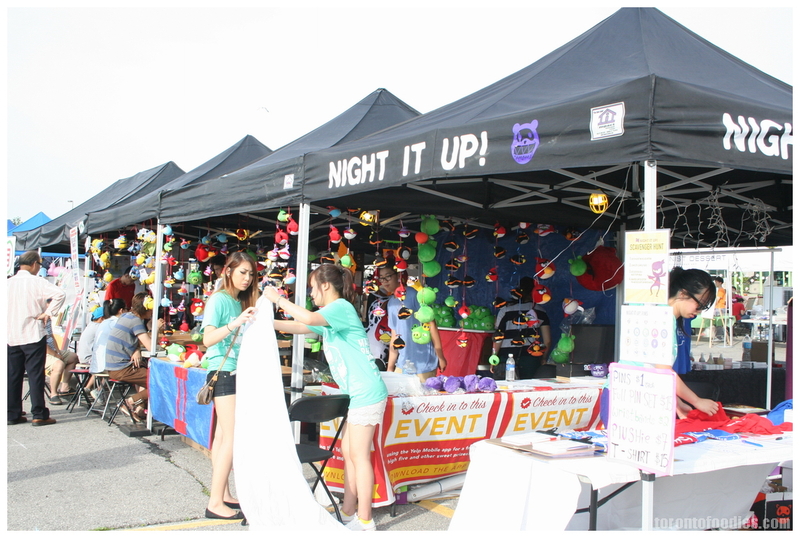 It’s great to see them make a return to Night It Up this year, and really highlights the entrepreneurial spirit that pops up year after year at NIU. 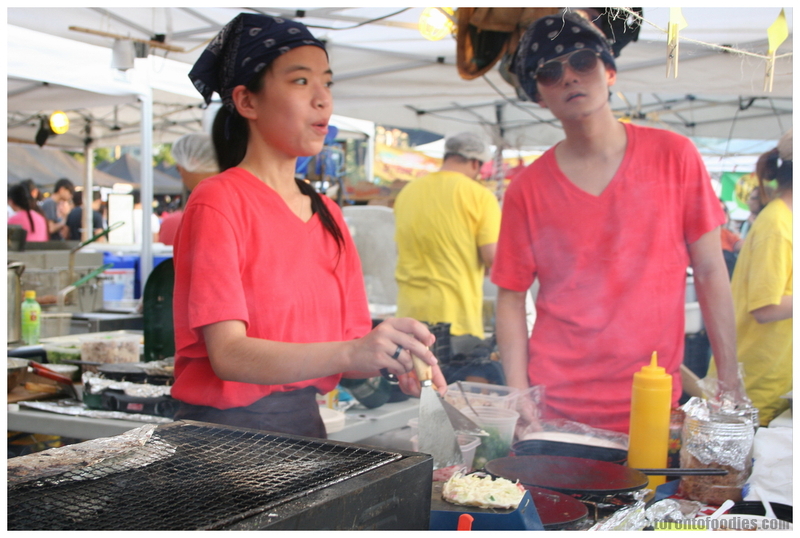 I am expecting to see them again next year, and hope to finally try their dishes. Also, their name is a palindrome! 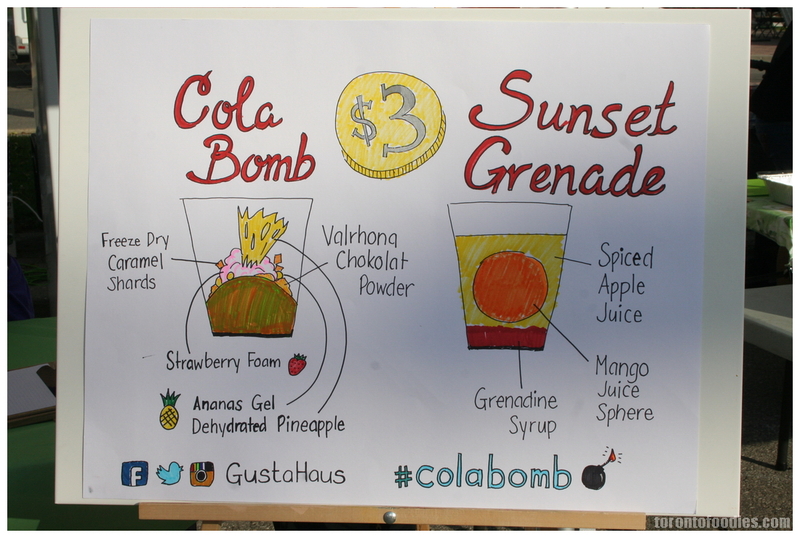 Modernist Dessert (by Gusta Haus of Sugar Art) (@GustaHaus), who had previewed their inventive menu at TOFoodFest, injected some molecular gastronomy into the offerings at NIU. 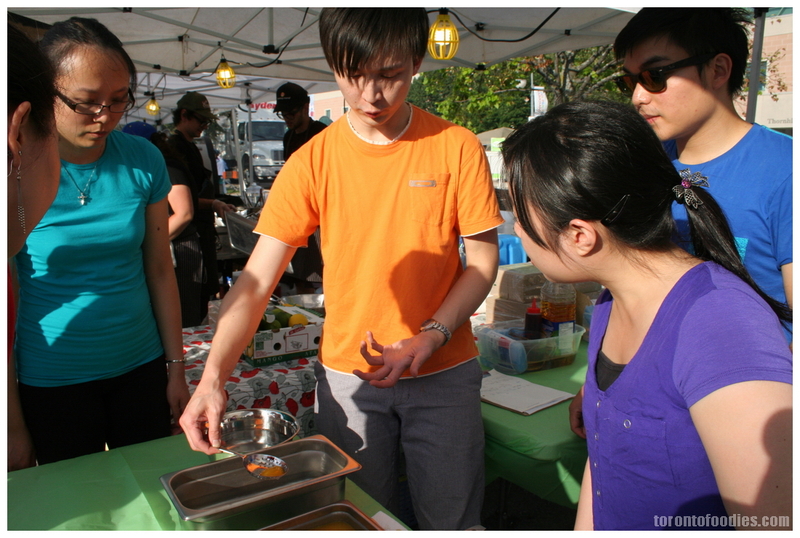 A crowd gathered as they demonstrated their spherification technique, turning mango juice into a round wobbly yolk. The mango is then layered into a shot glass, along with other ingredients like freeze-dried pineapple crisps. Very interesting stuff, but I did not try it myself. 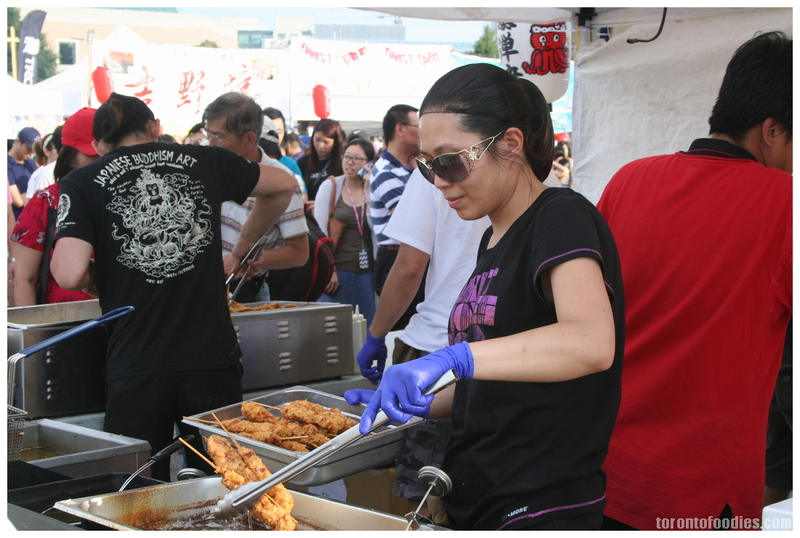 There was no shortage of memorable vendor names — Dat Chick Craze (@datchickcraze) offered up Taiwanese Popcorn Chicken and Chicken & Waffles. 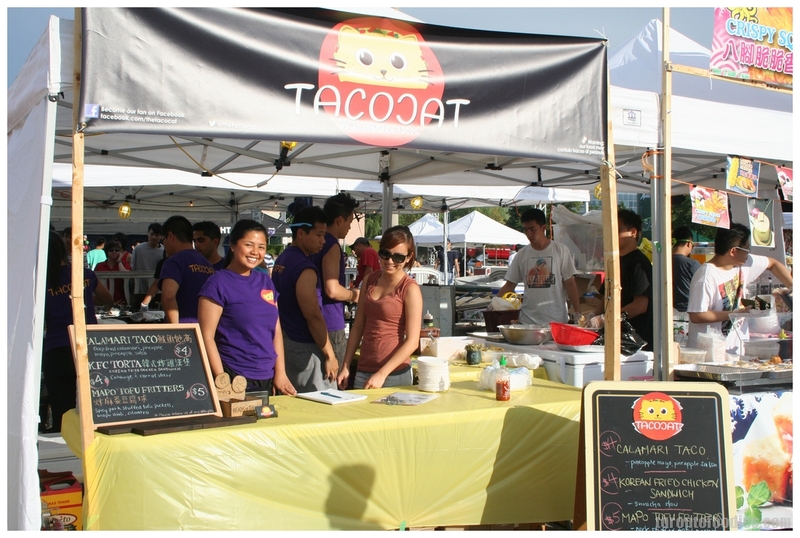 I also saw them the prior weekend at the Taste of Lawrence festival, and they will also be vending at the T&T Waterfront Night Market. I haven’t had a chance to try their food yet, but Facebook photos and buzz over the weekend are enticing me. 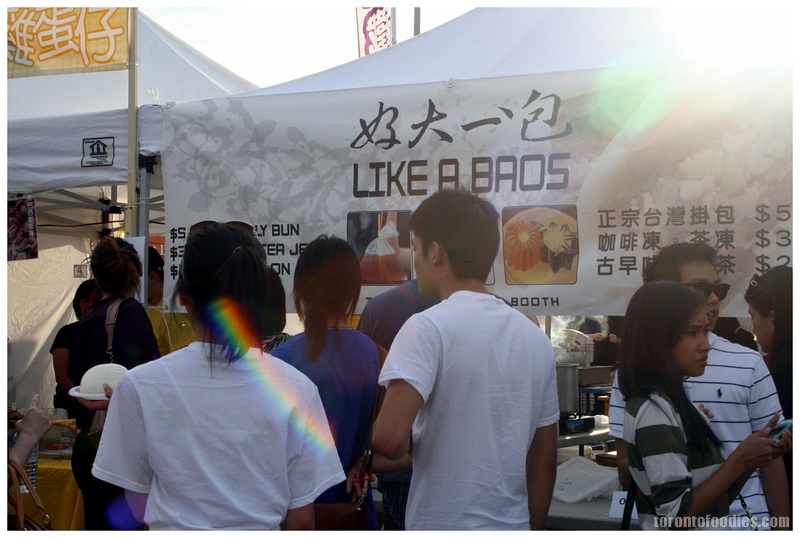 Among the other cleverly named vendors were 粉tastic (粉, pronounced ‘fun’, translates to rice noodle) and Like a Baos. Too many options, not enough tummy space (and pocket change) this year, sorry! 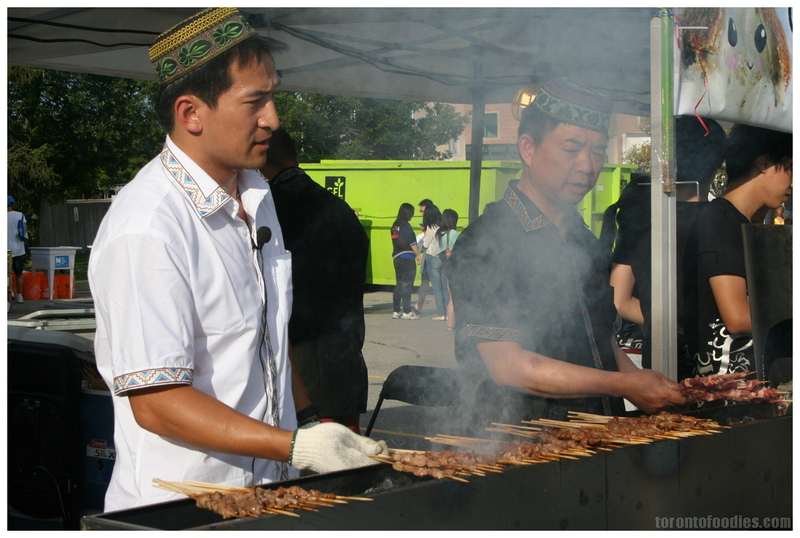 Kamayan was the only Filipino cuisine I recall from the event, offering up samples of their BBQ pork skewers. 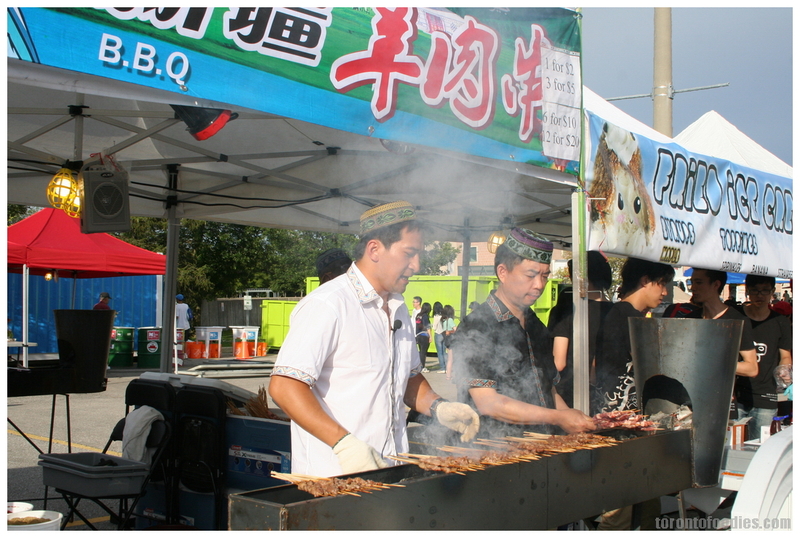 The pork (ticono, I think) skewer ($2) was amply flavoured from their sugar and salt marinade, and reasonably tender. 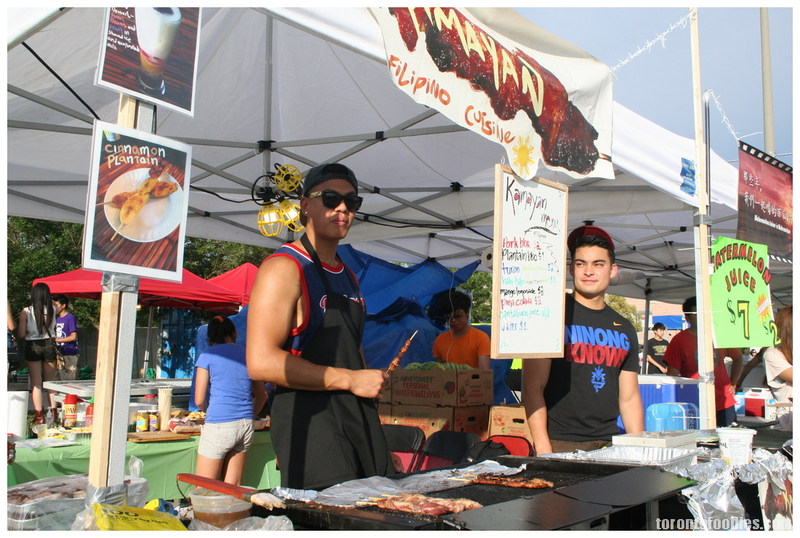 Kamayan is only working the event/festival circuit, but their family runs Marcelina’s near Bathurst/Wilson. 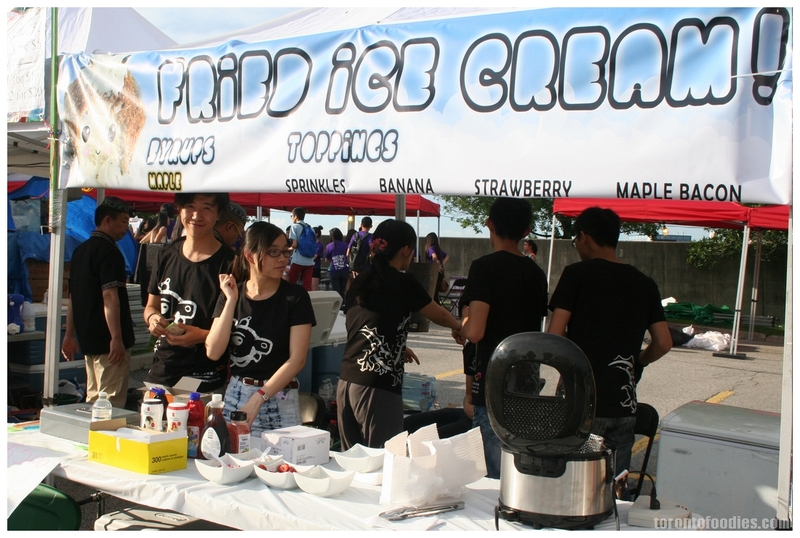 They will also be at the T&T Waterfront Night Market. Asian Sliders’ menu items on display. Refresh! Mobile Cafe Inc with plenty of deep fried items. 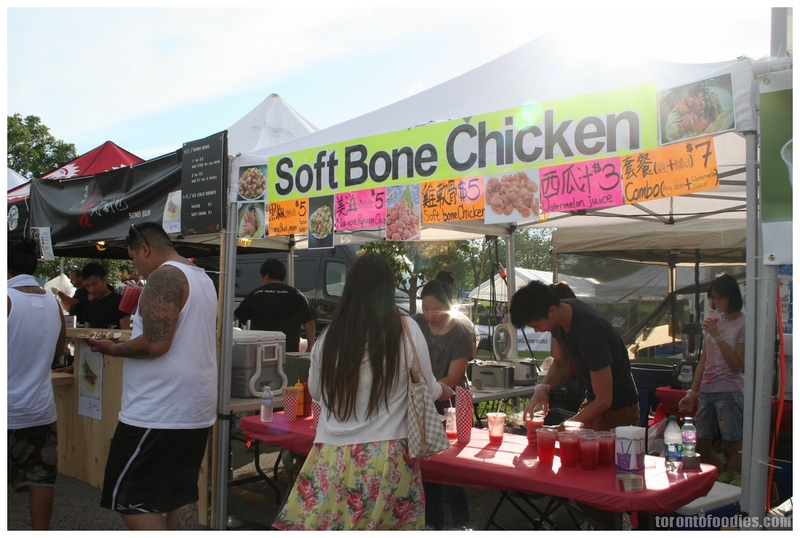 Soft Bone Chicken, a literal translation for Deep Fried Chicken Cartilage – a popular ikazaya snack. 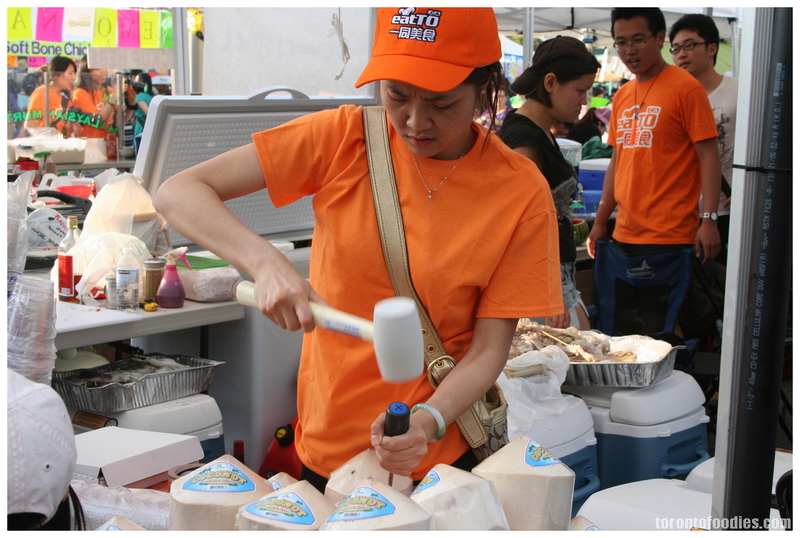 EatTO.ca selling coconut juice in their shells. 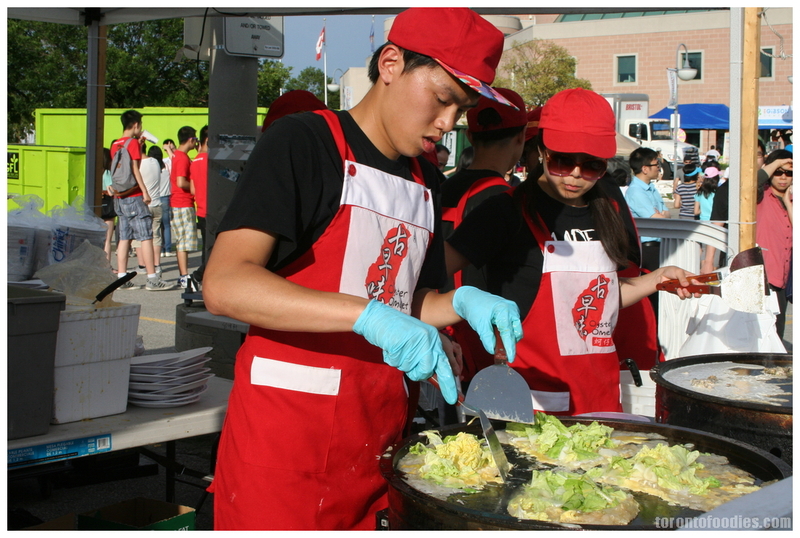 Okonomiyaki on Fire, selling Japanese-style savoury pancakes. I got my shaved ice from an igloo looking house near the back lot! It was really good, definitely reminds me of Taiwan. 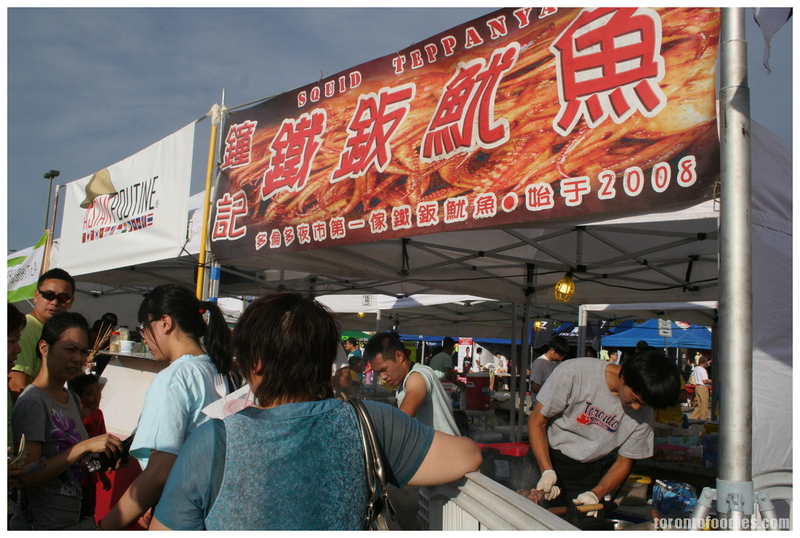 Not a big fan of skewers and stinky tofu so I didn’t get those. The line for takoyaki was too long so forget that. The only thing I really lined up for was for oyster omelete but there was too much of flour in it. Also got beaver tail and sumo buns. Beaver tail was really good, my first time having it surprisingly. 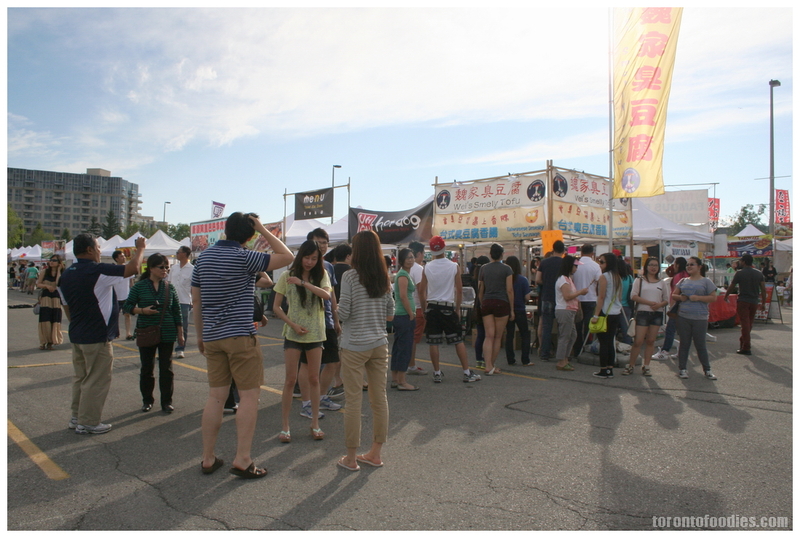 Sumo bun had too much bun and not enough meat, hahaha~ Until next year, no more street food for us Markham and Toronto ppl.